In our consulting work we find a big change from just a few years ago. Yesterday, companies wanted to dominate their category in the American market. Today, almost every company we work with wants to dominate the global market, not just the American market. Good thinking. Business is going global. Today, almost every category is dominated by global brands, not domestic brands. The iPhone and Samsung, for example, dominate the global market for smartphones. Pepsi and Coke dominate the global market for cola. Airbus and Boeing dominate the global market for passenger airplanes. Hewlett-Packard, Lenovo and Dell dominate the global market for personal computers. 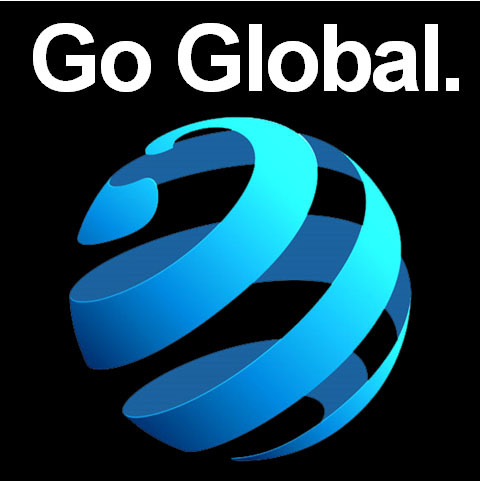 For many companies, “going global” means taking their existing brands and marketing them in some of the 200 countries of the world. Small countries versus big countries. When you travel the world, you will find that a company in a small country will often use its brand name on a wide range of products and services. That would never work in a big country where companies are much more focused. The same thing is true in small towns. In a small town, you might find a diner or a general restaurant selling a wide range of food. That would never work in a big city where the restaurant industry is much more specialized: Steak restaurants, seafood restaurants, Italian restaurants, Chinese restaurants, Mexican restaurants, etc. The general principle is widely recognized: The larger the market, the more focused your brand must become. Too many companies, however, forget about this general principle when they go global. Rather they take their existing brands and try to market them on the global market. Not a good idea. The larger the market, the more focused your brand must become. Names often do not travel well. In May of this year, Mitsubishi Motors fired its advertising agency and drove around seeking a new one. The automaker invested $95 million in U.S. measured media last year, up from $82 million in 2015. Mitsubishi? Does that name ring a bell in your mind? Do you remember any of those $95 million worth of advertisements? Mitsubishi is the eighth largest-selling automobile brand in Japan, but only 25th in America with 1.0 percent market share. In Japan, Toyota is No.1, Honda is No.2 and Nissan is No.5. All three brands are very successful in America. Toyota is No.2, Honda is No.4 and Nissan is No.5. You might be interested in the names of the No.3 and No.4 auto brands in Japan. The No.3 brand is Suzuki and the No.4 brand is Daihatsu. Both brands were total failures in America. Let me summarize. The No.1, No.2 and No.5 auto brands in Japan were highly successful in America. And the No.3 and the No.4 brands were not. Suzuki? Daihatsu? Even worse names than Mitsubishi. No wonder they went nowhere in America. Why didn’t these two companies change their brand names went they expanded into America? That’s what I would have recommended. Yet there is a strong belief that a company has to use a single brand name on the global market. Remember Datsun? A brand name developed by Nissan specifically for the American market. Datsun was a big success in America. By 1979, it was second only to Toyota as the largest-selling Japanese automobile brand. The next year the name was changed (at great expense) to Nissan. Why? There is a strong belief that a company has to use a single brand name on the global market. Last year, Nissan was third to Toyota among Japanese brands in the American market. So the new name didn’t do much for the company’s American sales. But these mistakes are minor compared to the mistakes being made in China, Russia, Greece and many other countries that do not use the Latin alphabet. Take 小蜜, a privately-owned Chinese high-tech company that was once valued at $45 billion. (In 2015, the company was the fifth-largest global smartphone maker.) Today, the company is worth about $3.6 billion, according to one financial analyst. You might know 小蜜 better as Xiaomi Inc, a typical victim of Pinyin, the official system for translating the sounds of Chinese characters into the Latin alphabet. Xiaomi is almost impossible for an English speaker to pronounce or spell. China is not only the largest country in the world in terms of population, but also one of the best known. But I wonder how many people would know about the country if they had to use its Pinyin name, Zhong Guo. I keep folders on quite a few Chinese brands that are either clients or prospects. Here are some of them: Chongqing Lifan, Chow Tai Fook, Shenyang Brilliance JinBei, Hong Yun Honghe, Jinmailang, Juewei, Li-Ka-Shing, Qingdao, Shang Xia, Sichuan Tengzhong, Tong Hu Shou Biao, Wanglaojie, Weixin, Wuliangye, Yun Nan Bai Yao, Xhuyeqing. But Chinese brands have an advantage, too. There is no reason they have to use Pinyin translations. Take our client, Great Wall Motor. Hover is the Pinyin translation of the company’s SUV brand. But the brand name could not be registered as a trademark in most countries because it conflicts with hovercraft, a generic word. No problem. Just keep the Chinese brand name exactly as it is and use Haval on the global market. Companies in countries that use the Latin alphabet don’t have this ability. It could cause endless confusion to use different spellings in different countries for a single brand name. I’m well aware of the name problem, having been an advertising account executive for the American launch of the two leading French automobile brands: Renault and Peugeot. Both brands were successful in France, but not on the global market. The names don’t sound well to English speakers, nor are they easy to spell or pronounce. But we couldn’t change the names in America unless we could also change the names in France, which would have been impossible. Any company in China can market its brand on the global market with any Latin name it chooses. That would not conflict with the brand name in China because the brand name in China uses Chinese characters and not the letters of the Latin alphabet. What an enormous advantage. Any Chinese brand could approach the global market with a blank sheet of paper. On that blank sheet, it could type out a brand name that could communicate the essence of the brand. Here is what Jack Trout and I said in our Positioning book: The name is the hook that hangs the brand on the product ladder in the prospect’s mind. In the positioning era, the single, most-important marketing decision you can make is what to name the brand.